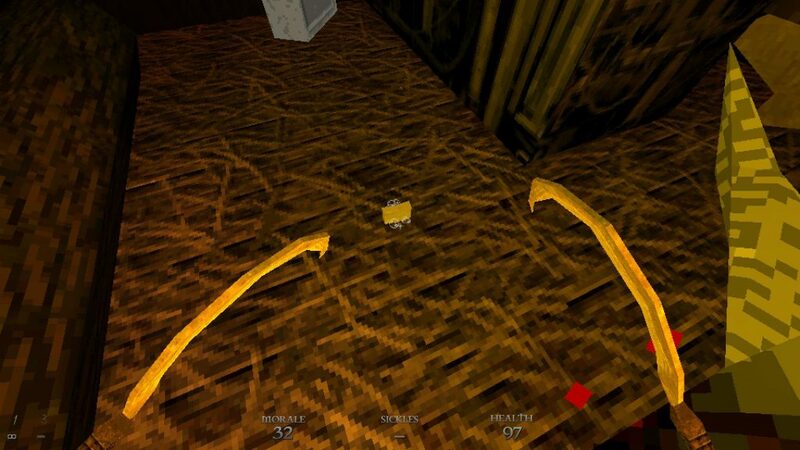 Soap is the ultimate weapon in Dusk, but it’s also a kind of collectible. It can kill any enemy in one shot, which makes it useful on levels with boss fights. There’s also an achievement that unlocks when you pick up a bar of soap on every level, called Don’t Drop It. If you’re having trouble finding any of the soap bars, this guide will help you by showing you all Dusk soap locations in Episode 1: The Foothills. Note: This guide is a work in progress. We’re missing some soap bars, but we’ll update it when we find them. The first one’s easy if you know what you’re looking for. As you leave the basement, go into the room on the left and go up the stairs. Hug the left wall and you’ll end up in a small bathroom. The soap will be on the floor behind the toilet bowl. When you start the second map, go past the barn and you’ll see a house. Go inside and enter the room at the end of the hallway, on the left. Climb the stairs, then go into the last room on the left. The soap will be in the soap holder in the shower. This is probably the easiest of the whole bunch. When you start the level in the tunnels, go forward. As soon as you reach the first intersection, look at the barrels on your left. The soap will be on one of them. When you start this map, turn left instead of going directly down the hill. You’ll see a train car at the bottom of the left path. Go down to it and jump inside. Turn right, and you’ll notice the soap bubbles rising from the wooden box. Go between the silos and across the field until you reach the house. There’s a door on the right side – go inside and use the stairs at the end of the hallway. Once you’re upstairs, the first door on the right will lead you into the bathroom. The soap will be on the floor in shower. The soap is near the beginning of the level. At the far side of the gorge, when you climb up the cliff on the left and go through the red door, you’ll see a shelf on the left, at the bottom of the stairs. The bar will be on the top shelf near the door. After you exit the alley, turn right immediately. Go to the end of the road and look left. You’ll see a crack on the wall. You’ll need to throw some explosives at it – there are fuel cans around the map, but you can also use the explosive barrels from the garage behind you. Once you break it, go inside and look left. You’ll see another crack on the wall past the table. Use the fuel can from the room to break it, then go through the hole into the walled-up bathroom. The soap will be on the toilet tank.